One band and cross band instep straps. Adjustable velcro closure for an easy an and off. Ornamental buckle is non-functional. 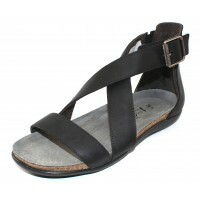 Leather padded linings and contoured footbed with cork midsole. 3/4 inch TPR rubber sole. Made in Israel. Part of the Elegant Flats Collection. Fits narrow to medium width. Superbly crafted, healthful, comfortable and fashionable. Naot is an international success story. When the members of Kibbutz Naot Mordechai founded the kibbutz shoe factory in 1942 as a one room workshop, no one imagined that in fifty years’ time their shoes would be worn all over the world. The small shoe factory that made simple work shoes and sandals has become an international business and is now Israel’s leading manufacturer and exporter of shoes. It is no wonder Naot means oasis! One band and cross band instep straps. Adjustable velcro closure for an easy an and off. Ornamenta..
One band and cross band instep straps. Adjustable velcro closure for an easy an and off. Ornamental ..